Tomorrow is Thanksgiving in the US. 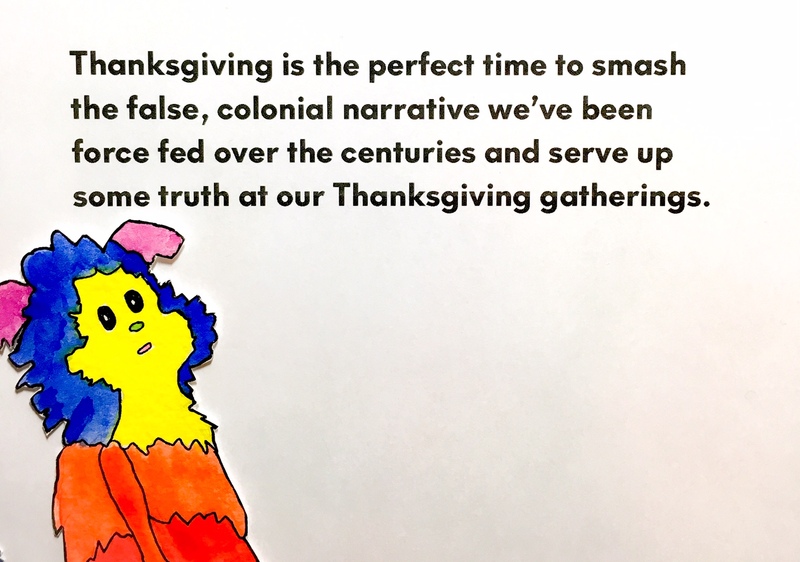 Let us remember and acknowledge that the Thanksgiving story has been twisted and manipulated to service the colonial systems we function within everyday. If someone you know is perpetuating the traditional, incomplete, and false Thanksgiving narrative, call them in and share a different, contrasting perspective. Place indigenous people and their ancestors whose land was stolen (the land upon which we currently live, work, and benefit from) at the center of your Thanksgiving observance. Not sure how to start that difficult conversation? Marabou directs you to a resource guide compiled by the Center for Racial Justice in Education (formerly known as Border Crossers). This guide has sources to aid you in facilitating conversations about Thanksgiving that span the spectrum of people you will encounter over the holiday, from children to adults. Need a way to explain why encouraging children to dress up like “pilgrims and indians” is a harmful perpetuation of oppressive power dynamics? Need some facts and quotes that help illustrate why Thanksgiving is also a Day of Mourning? Racial Justice Guide to Thanksgiving can lead you to that information. Sources are pulled from many outlets, including Teaching Tolerance and ArtandJustice.org. Marabou is grateful to the Center for Racial Justice in Education and to all the thoughtful and generous people who openly share their tools that aid in constructing just and representative histories. Below is one of the many sources Marabou found helpful in reimagining an American celebration of Thanksgiving. Visit the guide and see what is most helpful for you! What are you giving thanks for on Thursday? This Haudenosaunee (also known as the Iroquois Confederacy or Six Nations — Mohawk, Oneida, Cayuga, Onondaga, Seneca, and Tuscarora) giving of thanks encompasses much more than what the average American remembers to be thankful for. It is used to open and close meetings and gatherings, so recited on a regular basis, not just once a year. As described on danceforallpeople.com, “The Thanksgiving Address teaches mutual respect, conservation, love, generosity, and the responsibility to understand that what is done to one part of the Web of Life, we do to ourselves.” Reading this Thanksgiving Address will likely lengthen the “I’m thankful for…” list of most friends and family sitting around your Thanksgiving table. For Marabou, this address offers a deeper and more thoughtful way to appreciate the world that surrounds us. The Haudenosaunee Thanksgiving Address below is from Danceforallpeople.com. It is a translation of the Mohawk version of the Haudenosaunee Thanksgiving Address drawn from the 1993 version that was developed by the Six Nations Indian Museum and the Tracking Project.